Lucky bamboo is a common type of houseplant that requires little care to keep it looking healthy. 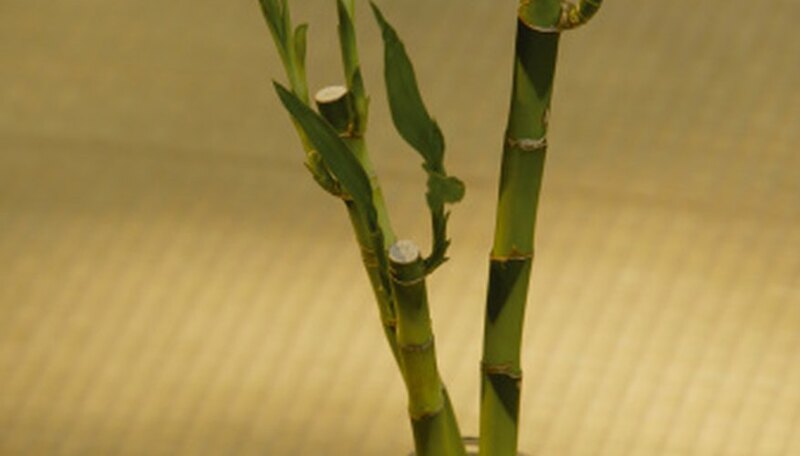 Lucky bamboo should ideally be a light green or yellow in color, but it shouldn’t appear too yellow as this can signal that the plant is not healthy. Lucky bamboo can also develop black mold spots on it. Care for the plant properly to make sure it doesn’t turn yellow or develop black spots. The lucky bamboo plant can turn yellow if it gets too much direct sunlight. Lucky bamboo naturally grows in shaded areas. Lucky bamboo can live in an area that has little natural light. In some areas, fluoride is added to the water. This fluoride can build up in the plant's soil or water. It will then build up in the plant itself and cause the leaves to turn yellow. Prevent this by using only non-fluoridated tap or distilled water. Adding too much fertilizer to your lucky bamboo plant will cause the leaves to turn brown and yellow. Prevent this by only fertilizing the plant every few months depending on how big the plant is and the type of fertilizer. If the stalks are completely yellow, it is likely that the plant will die. Using too much water on the plant will cause it to form black spots on the leaves and on the stalks. Prevent this by watering the plant less; make sure the water doesn’t pool on the soil.